Only in Texas???? Or Africa! Last weekend my wife and I attended a party at a ranch in the Hill Country of Texas about 25 miles from our house. In order to get to this ranch, we had to drive through another ranch. This other ranch had exotic game wandering about. It was like driving in a zoo, or in Africa. 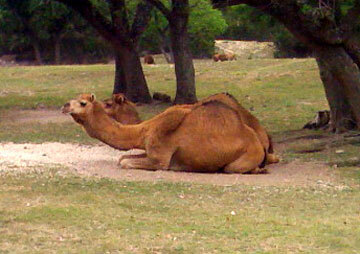 At first we saw camels. They looked harmless enough, and didn’t seem interested in us. Later, I learned that one of these camels has a foundness for side view mirrors on cars, and had torn off several over the years. I’m glad we didn’t have such an encounter with this camel. 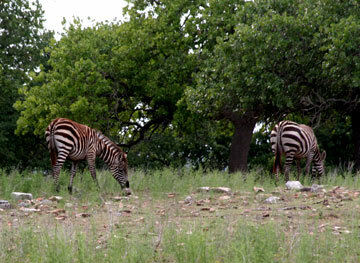 Farm Road 473, 10:15 p.m., Caller said a stray zebra was standing in her front yard. While an officer was en route, a vehicle hit the animal which sustained minor injuries. Animal control loaded the zebra into a trailer and took it to the wildlife refuge. Finally we saw two animals that looked very odd. They seemed to be cattle of some sort, but with gigantic horns. Not only were the horns quite long, but they were very large in circumference. When I got home I did some Internet research. It turns out that these animals are Ankole-Watusi cattle from Africa. They were brought to the U.S. about 50 years ago. 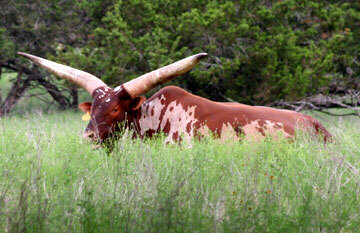 One Ankole-Watusi steer has the Guinness Book record for the largest horn circumference. Check out this website devoted to “Lurch” with the giant horns. Oh, the surprises of Texas!